Line an 8x8-inch baking dish with foil and oil it lightly with a paper towel (or spray generously with non-stick cooking spray) for easier removal later. Add coconut to a skillet over low heat. Cook, stirring regularly, until coconut is just toasted and slightly browned. Watch it closely so it doesn’t burn. Remove from heat immediately and transfer coconut to a small bowl. 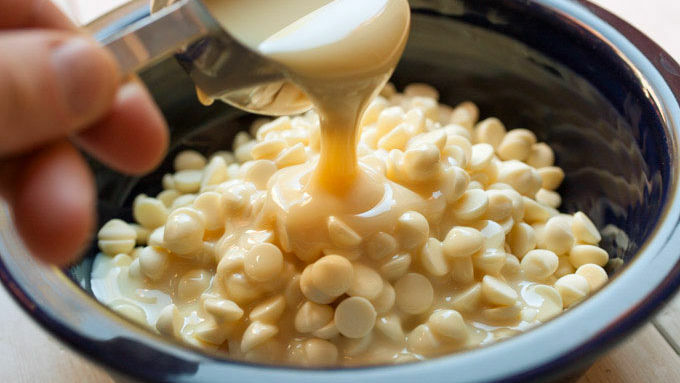 In a large microwave-safe bowl, combine white chocolate chips and sweetened condensed milk. 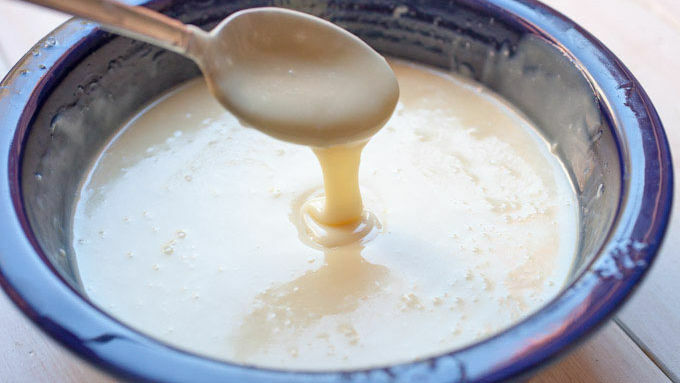 Microwave on high in 30-second intervals, stirring well in between, until mixture is smooth. Stir in RumChata™ and microwave for 30 seconds more, or until mixture starts to bubble. Stir well for 10-15 seconds so that RumChata™ is completely incorporated. 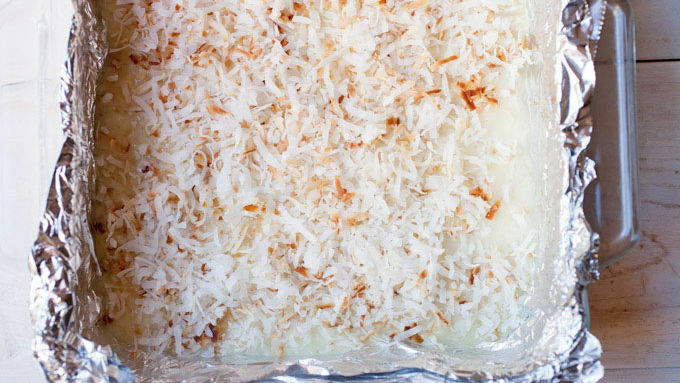 Stir in 1 cup of the toasted coconut and transfer mixture to the prepared baking dish. Spread mixture out so it’s evenly distributed and top with remaining coconut. Refrigerate fudge for 3-4 hours until completely set. Cut into even squares (you should get at least 16). Store extra fudge in the fridge up to one week. For a non-alcoholic version, replace the RumChata™ with an equal amount of sweetened condensed milk. Making fudge at home can be an involved process. Making traditional fudge involves tempering the chocolate and chilling it perfectly. It can be a bit finicky. This recipe is none of those things. It’s fast, easy to make, and tastes amazing. Plus, it has only four ingredients! 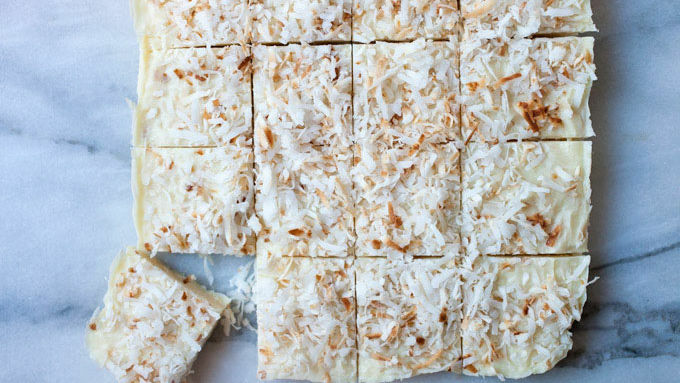 The first step to this fudge, and honestly the hardest part, is toasting the coconut. Add your shredded coconut to a skillet over low heat and toast it in the skillet until it’s browned and fragrant. You really want to keep an eye on it and stir it regularly. It can go from perfect to burned very quickly. This fudge is so rich and delicious! YUM. Making fudge at home can be an involved process. Making traditional fudge involves tempering the chocolate and chilling it perfectly. It can be a bit finicky. This recipe is none of those things. It’s fast, easy to make, and tastes amazing. Plus, it has only four ingredients! 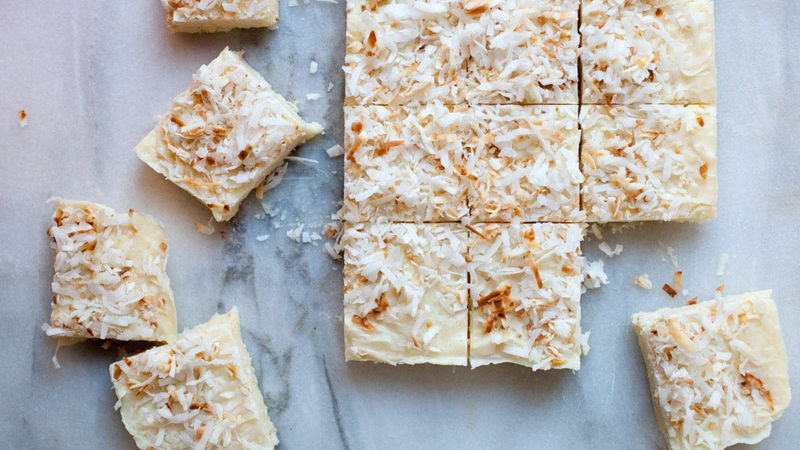 The first step to this fudge, and honestly the hardest part, is toasting the coconut. 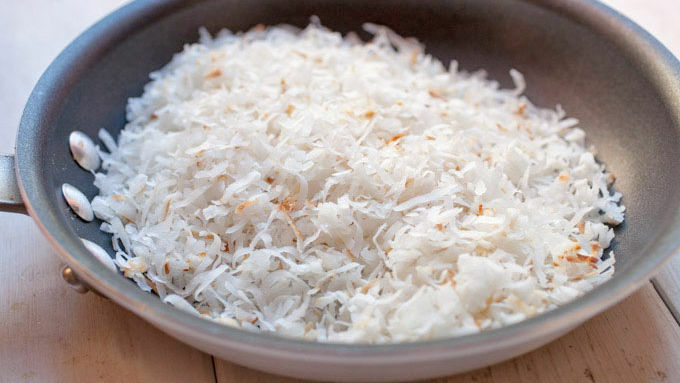 Add your shredded coconut to a skillet over low heat and toast it in the skillet until it’s browned and fragrant. You really want to keep an eye on it and stir it regularly. It can go from perfect to burned very quickly. This fudge is so rich and delicious! YUM.